Manchester – home of Britain’s longest-running soap, Coronation Street. Come to MediaCity in Salford on any day of the week and you’ll probably see a crowd of people hanging around. Why are they here? It’s because MediaCity is the home of TV soap Coronation Street, and the chance to meet one of the stars brings fans from all over the world. Despite its recent location change, Coronation Street has been filmed in Manchester ever since its very first episode aired on ITV on 9th December 1960 .Local writer Tony Warren created the show based on his experiences in the close knit communities in the terraced streets around Manchester Docks. The actual street that the show was based on, Archie Street, was in Ordsall, but was demolished in the 1960′s. However, St Clement’s Church is still standing and so we can still pinpoint where the original street was. However, the show was originally filmed at Granada TV studios for a whopping 53 years, until the cobbles re-located to MediaCity in 2014. The world famous street, complete with the Rovers Return Inn, Roy’s Rolls, Underworld and many more key Coronation Street locations, had to be completely rebuilt which took around 2 years from start to finish. For viewers, the rebuild is barely detectable on-screen, however the houses were actually re-scaled to almost full size where they were previously only three-quarter size. So, what happened to the old Coronation Street set over at Granada Studios? Well, following the show’s relocation, the old Quay Street set was open for a public tour from April 2014 until December 2015. 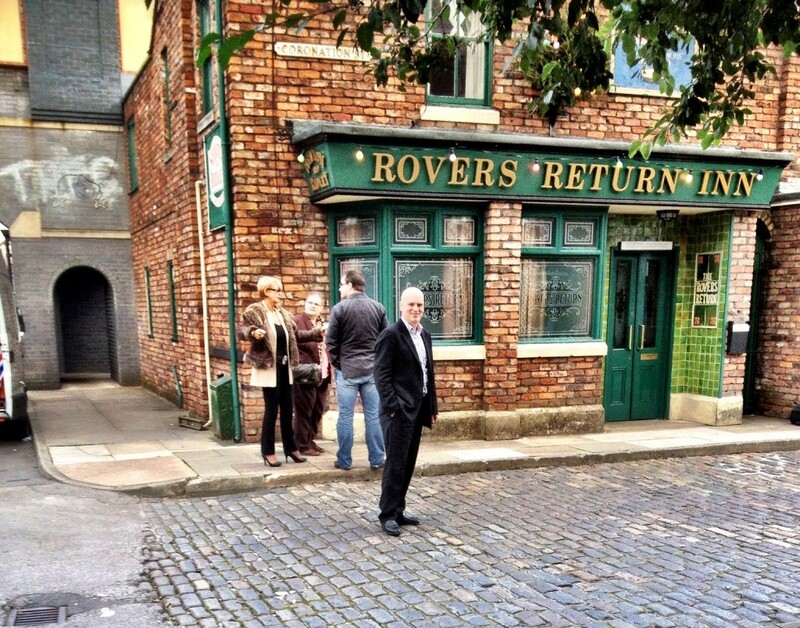 Corrie fans were allowed to buy tickets to walk down the famous Coronation Street cobbles, pay a visit to the Rovers Return and gain exclusive access to set interiors for the first time ever. It was a sad day for Coronation Street fans all over the world back in April this year, when the Granada Studios set which was home to the show for over half a century, was demolished. The old set no longer exists, the main filming of the show has now fully been transferred to MediaCity, and fans can no longer tour the set. Not to worry though, as here at Manchester Taxi Tours, we often bespoke Coronation Street tours which takes you to many important Corrie locations that still exist around the city. We can take you to visit some of the most used and recognisable sites, or perhaps you have a favourite scene or memory of your own. Just tell us what it is and we’ll find it for you – more than likely, we’ll probably have a story of our own to tell too! And, although we can’t go on to the set itself, Manchester Taxi Tours can take you to the only place in Manchester where you can look into the ‘Street’, and many more exciting places. St Mary’s Church in Prestwich is always a popular stop on our Coronation Street tours, as it’s been home to many of the wedding, funeral and christening ceremonies that have been filmed for the show. (And believe us, there has been many!). These include the Corrie nuptials of Peter and Leanne, Jason and Sarah, Fred and Bev, and more recently, the funeral of Callum Logan. In the proggramme, it is usually referred to as St Thomas’s Church, and is one of a few locations that has seen many Coronation Street marriages start. We can also take you to Chimney Pot Park in Salford, which overlooks the terraced street and is probably the most popular spot as it features in the Coronation Street credits. Another key location is Castlefield Canal, which was most famously featured on the show at the time when Tony Gordon tried to drown Roy Cropper, with the area now widely known as “Cropper’s Corner”. Another Cropper storyline that featured a popular Manchester location was back in 2010 when Roy and Hayley Cropper travelled to their wedding on the East Lancs Steam Railway, which we can also pay a visit to. Many a Coronation Street episodes has featured a court room scene of some sort, with a lot of them taking place in The old Salford Town Hall. From this location, we’ve seen many tears, tantrums and convictions appear on the show. There are tons more Coronation Street related locations scattered around the city just waiting for you to pay a visit. However, we wouldn’t want to give them all away too soon, so why not come on a Coronation Street tour with us to explore the rest? Perhaps you have already spotted Manchester Taxi Tours’ very own John Consterdine on Coronation Street, as he has been an extra on the show more than once. How did he manage to get on the show? Come on a tour and we’ll tell you. Get in touch with us now to find out more about our custom Coronation Street tours, and we can help you build your own dream tour.